The azmari is the Ethiopian equivalent of the West African griot - a troubadour, a truth-teller and "court jester" all in one, disdained and beloved at the same time. The essential release Éthiopiques 2: Techawet! : Urban Azmaris of the '90s (Buda Musique 82952-2, 1997) traces the development of a new urban form of the azmari's art to the the fall of the putatively "Marxist-Leninist" Dergue regime in 1991. Restricted by a curfew for the previous 18 years, residents of Addis Ababa took to nightlife with a vengeance, giving rise to many new azmarebets, or cabarets devoted to this musical form. The usual azmari ensemble is composed of one or two vocalists, players of the krar (Ethiopian lyre), masinqo (one-stringed violin), percussion and perhaps accordeon. 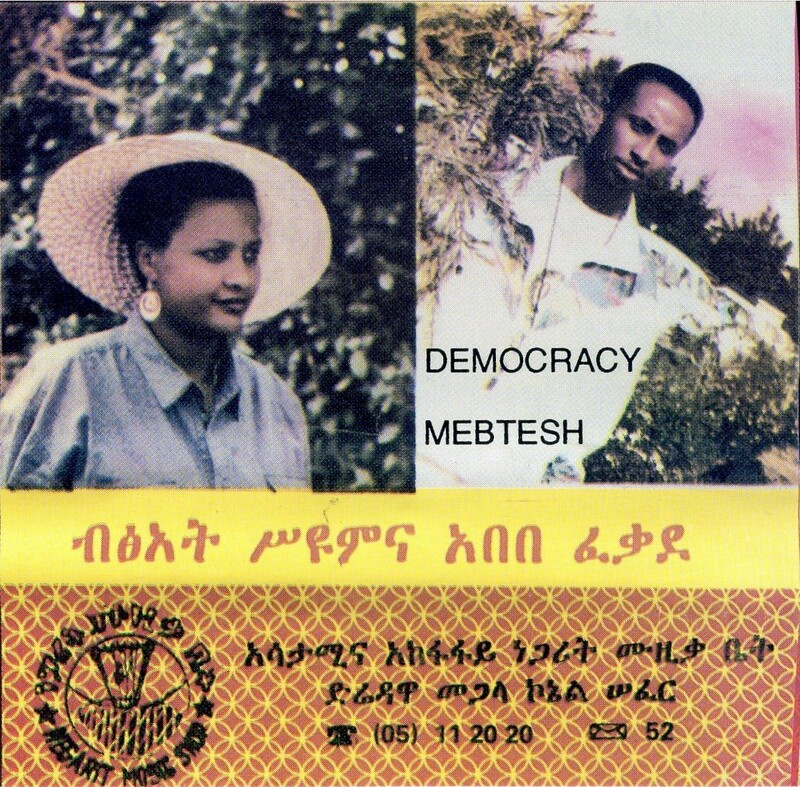 As today's selection, the cassette Democracy Mebtesh (Negarit Music Shop, ca. 1992) illustrates, this combination can be supplemented by organ or synthesiser, electric bass and drum machine (somewhat to the detriment of the music, in my opinion). The title, Democracy Mebtesh ("Your Democratic Right"), clearly alludes to the atmosphere that prevailed in Ethiopia in the early '90s after the fall of the Dergue and the rise of a new government led by the Ethiopian People's Revolutionary Democratic Front. My friend Andreas Wetter writes, "...I think it is meant in a rather ironic way. I remember having heard it used by people from time to time. The media was full of words about democracy but everyone knew that there was no real democracy. People usually felt a subtle oppression and didn't believe in the offiocial discourse, because there were imprisonments, often arbitrary, and even killings." Our featured artists, Betsat Seyoum Abhra and Abbebe Fekade, exemplify the new urban azmariwotch. Betsat, born in 1965, does not come from a musical family but found her calling in 1985 performing in various establishments in Addis before opening her own azmarebet in 1990. Abbebe, born in 1970, by contrast comes from a musical heritage in the province of Gondar, where his father was an azmari.Performing together in Betsat's establishment, they are naturally simpatico! As Falceto further explains, the words are more than what they seem. 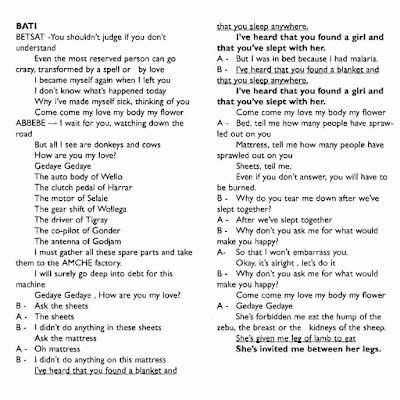 The underlined lyrics above are the literal meaning whereas the boldface are the actual meaning. The Abyssinica Dictionary explains, "Wax and Gold is the formula used by the Ethiopians to symbolize their favorite form of verse. It is a form build of two semantic layers. The apparent, figurative meaning of the words is called 'Wax'; their hidden actual significance is the 'Gold'. The term Wax and Gold is derived from the work of the goldsmith, who constructs a clay mold around a from created in wax and then, draining the wax, pours the molten gold into that form...." During the time of Haile Selassie and later under the Dergue such verbal subterfuge was a vital form of social protest. Tezeta (or "Tizita") is often described as "Ethiopian Blues." The word means "memory" or "nostalgia," and like Bati above, it is one of the four major kiñits, or modes, of Ethiopian music. No two versions of Tezeta, even if literally called "Tezeta," will ever be the same. Falceto, in the liner notes of Éthiopiques 10: Tezeta: Ethiopian Blues & Ballads (Buda Musique 82222-2, 2002), writes,"...Singing one's sadness isn't as paradoxical as it may seem. There has to be a way to get through life's cruel twists of fate, and from the world's often comes the inspiration to overcome alll manners of adversity, public or private. Might as well do it in a song. If the Afro-American blues is the best-known means of expression combining music with wallowing in misery, there are many musical cultures throughout the world that have formulated in their own way this odd mixture of brightness and gloom, heavy-handedness and lightness of heart..."
"Enneggänaññallän" = "We Will Meet." Ambassel is the name of a district in Wollo Province and is also one of the four kiñits of Ethiopian music. Wikipedia describes it as the mode used for songs with historical themes. "Ende Näh" = "How Are You?" "Lomi Nahe (She) Waye" = "You are a Lime" (a term of affection). Download Democracy Mebtesh as a zipped file here. Many thanks to Andreas Wetter, who, as always, has provided much useful information for this post. The liner notes of Éthiopiques 2, Éthiopiques 10 and Urban Azmaris of Ethiopia were also quite helpful. If you really want to dig into the details of Ethiopian musical theory (something that's above my head), you might like to read this article by Timothy Johnson, who discusses the four major kiñits of Ethiopian music - Bati, Tezeta, Ambassel and Anchihoye. This article by Ezra Abate is also quite detailed.